There’s practically no way to avoid the oh-so-very nebulous “cloud” that makes almost all of our computing needs possible today. While it was once the punchline to poorly-informed jokes about where our personal pictures went after we uploaded them online, the masses now realize that the cloud is crucial. From streaming music to email programs and even using software that we once had to purchase off store shelves, cloud computing makes immediate access to large volumes of data possible. Adesh Tyagi, who is president of Systems America, Inc., has seen what the cloud can do for consumers and its why his company among many others is designing modern infrastructure and security solutions. In fact, he feels that we’d quickly be running out of room to put new computers and hard drives if it weren’t for this ability to immediately recall data from the cloud network. Microsoft Azure, which is a partial client of Systems America and Adesh Tyagi, has this to say about the cloud: “Cloud computing is the delivery of computing services—servers, storage, databases, networking, software, analytics, and more—over the Internet.” Microsoft goes on to say in its explainer piece, “Companies offering these computing services are called cloud providers and typically charge for cloud computing services based on usage, similar to how you’re billed for water or electricity at home.” It may surprise some to discover that even the earliest cloud-computing services are only a decade old at this point. That just goes to show that there are still great gains to be made in this field. According to Microsoft Azure, some uses for cloud computing include creation of apps, storing of data, website hosting, media streaming or providing software on demand. When Adesh Tyagi was a guest on the “Big Biz Show,” he equated the cloud to a digital hard drive that could be accessed from anywhere. That mobility is key today, given the fact that the smartphones we all own and use allows us to access apps, streaming accounts and other programs that we pay for as long as we’ve got our phone handy. Among the many modernization efforts that Mr. Tyagi’s company can help clients undertake, it’s the infrastructure, platform and software-as-a-service offerings that really drive home the point of cloud computing. 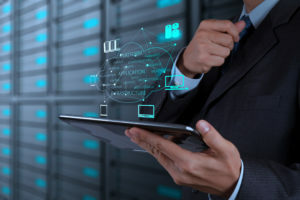 While each of these routes delivers a different program at the end, it’s the network of cloud-based servers that connect clients with all-new opportunities. Adesh Tyagi says that platform-as-a-service allows for expanded app testing while software-as-a-service is valuable for providing non-physical copies of programs and platform-as-a-service is instrumental for data storage and global access.